Total internal reflection fluorescence microscopy (TIRFM) is an elegant optical technique utilized to observe single molecule fluorescence at surfaces and interfaces. TIRFM exploits the unique properties of an induced evanescent wave or field in a limited specimen region immediately adjacent to the interface between two media having different refractive indices. In practice, the most commonly utilized interface is the contact area between a specimen (usually a cell culture) and a glass coverslip. 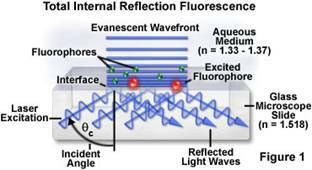 The evanescent wave effectively penetrates only 200 nm past the coverslip so only fluorophores in this region are excited. This results in a vastly improved signal to noise ratios and puts much less light stress on the cells. The technique is commonly employed to investigate the interaction of molecules with surfaces, an area which is of fundamental importance to a wide spectrum of disciplines in cell and molecular biology. Some applications include; Receptor-ligand binding, membrane recycling, cell adhesion, polymerization dynamics, internalization, trafficking and transport. The system is based on a fully motorized Leica inverted light equipped with a motorized stage and temperature, CO2 and humidity control. 63x and 100x TIRF lenses are available. TIRF excitation is via lasers with wavelengths of 405 nm, 488 nm, 561 nm and 635 nm. The instrument can also be operated in widefield mode using either the lasers or a metal halide lamp as the excitation source. Special filter sets and software are available for FRET imaging using CFP/YFP and GFP/RFP FRET pairs. Contact Tom Moninger at thomas-moninger@uiowa.edu or 335-8142 for more details.